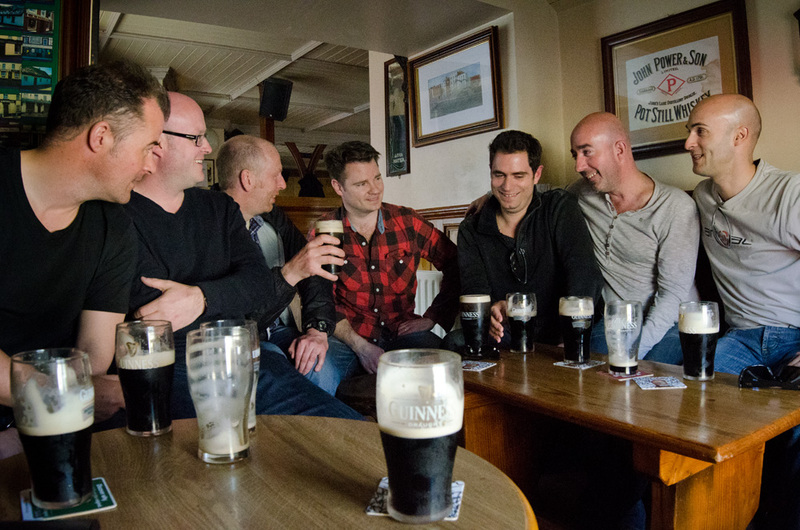 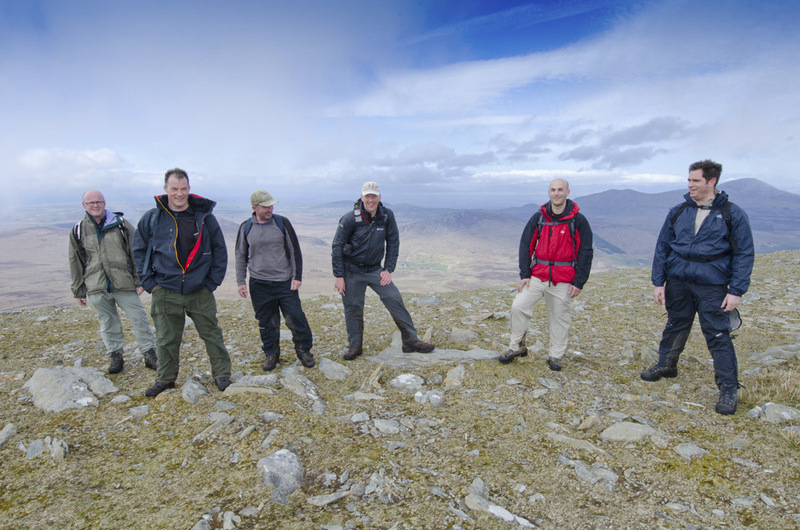 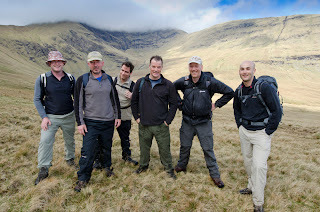 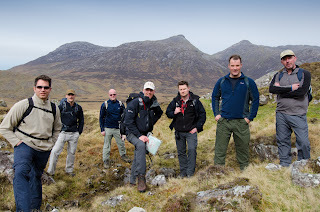 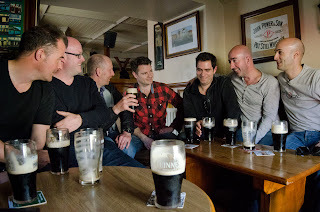 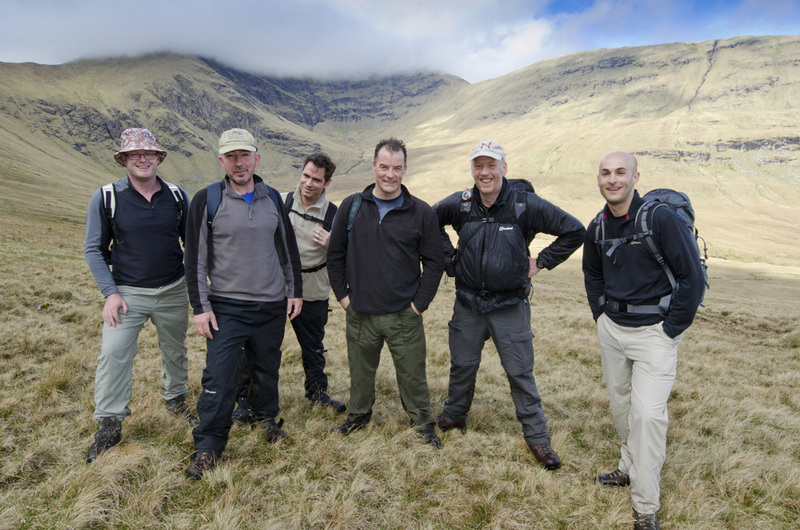 Two days of walking with seven friends: me (Mark), Giles, Chris, Tony, Luke, Nick, Dean and Stuart. 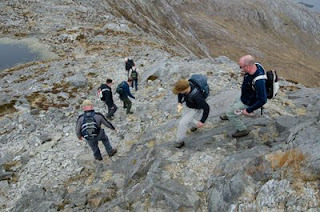 A weekend of mountains walks during the day, and Guinness at Matt Molloys bar, Westport in the evening. Perfect. 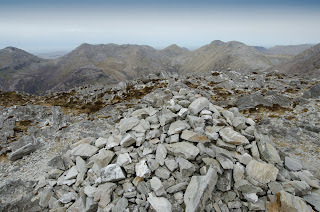 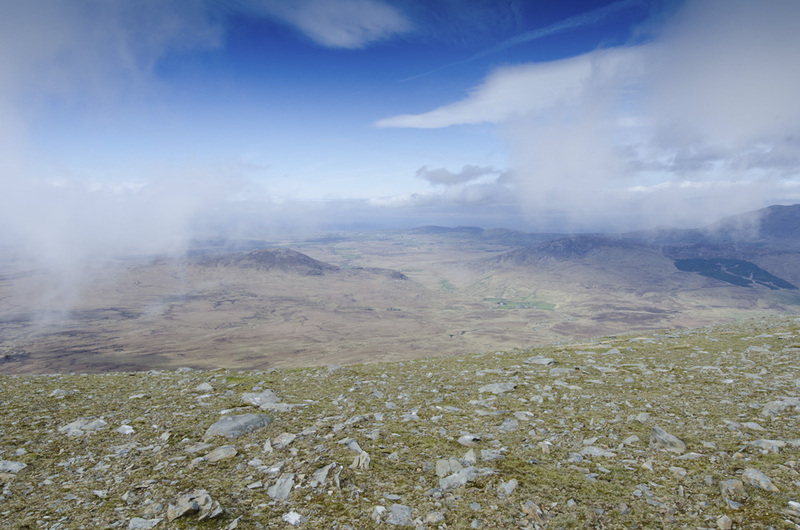 Challenging walk in the heart of the Twelve Bens mountain range, taking in five peaks including Derryclare, Bencorr (711m), Bencollaghduff (696m), Maumina (563m) and Benbreen (691m). The walk took us almost 8 hours to complete. 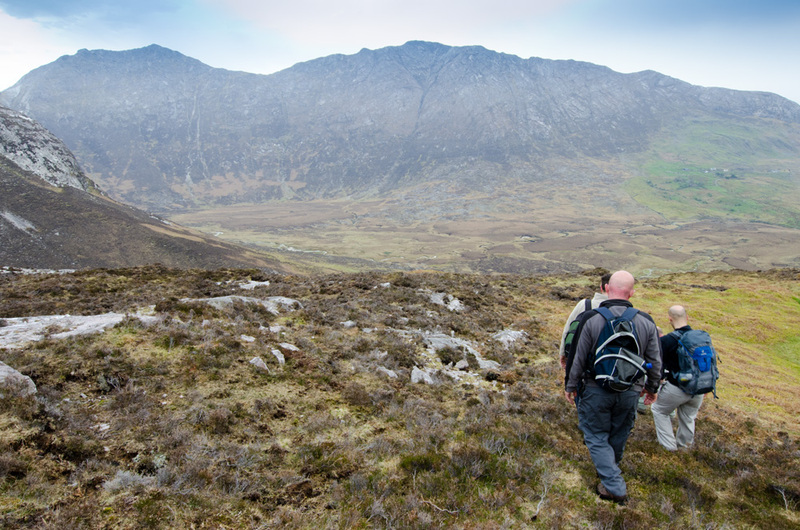 Although only about 10km in distance, the walk included around 1,500m of ascent. 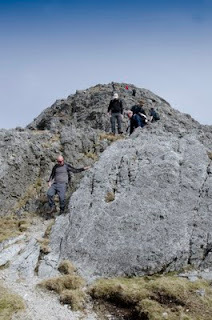 The entire day was spent either climbing up or down rocky mountains, as there are very few flat sections along this walk. 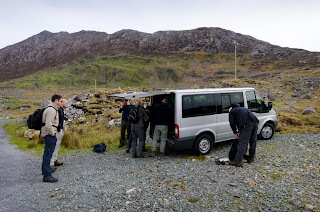 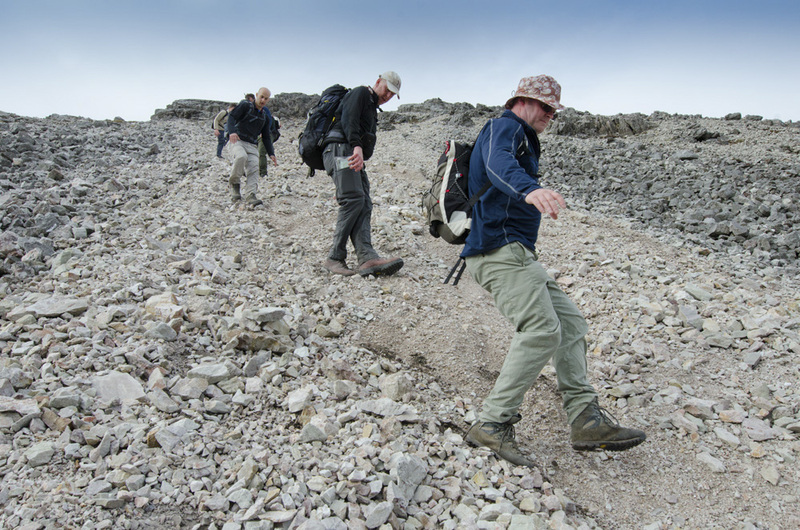 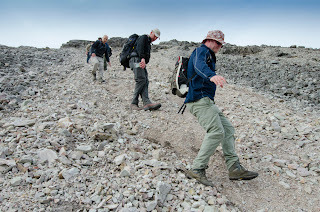 The main challenge was steep ground, with several very steep scree runs or rocky scrambles to negotiate. 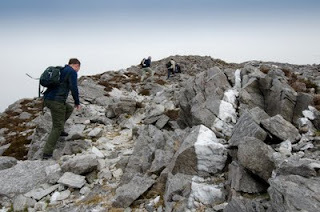 There was also one narrow and steep ridge to descend from Bencollaghduff, as well as a long and steep scree run from Benbreen. We then turned east from the col between Benbreen and Bengower back into Glencoaghan. 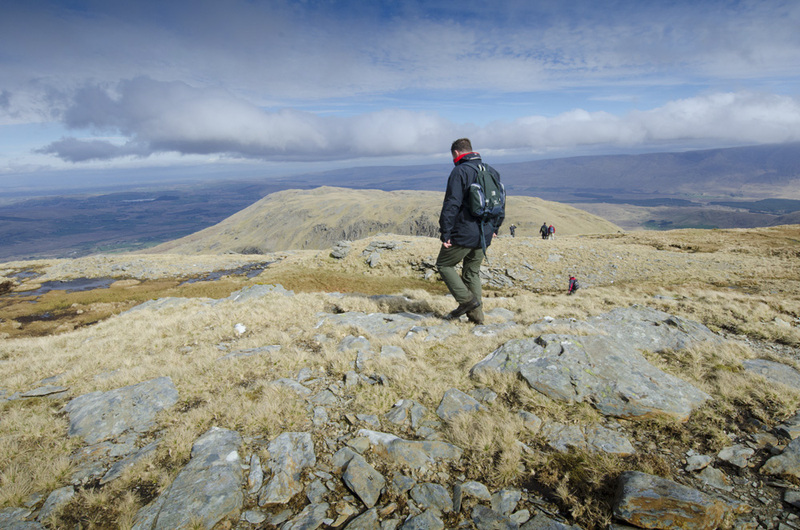 A superb mountain day. 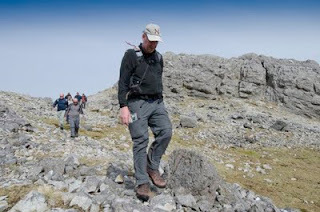 Map and compass essential to ensure the correct line of ascent/descent as the walk is pathless in places and the route is bounded by some serious cliffs. 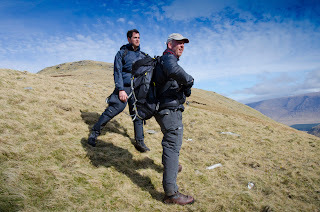 A gentler walk (relatively speaking!) up onto the broad ridge of the Sheeffry Hills in Co Mayo. Parked near Sheeffry Bridge and then walked up into Glenlaur before striking south up onto the col on the southern arm of the horseshoe. 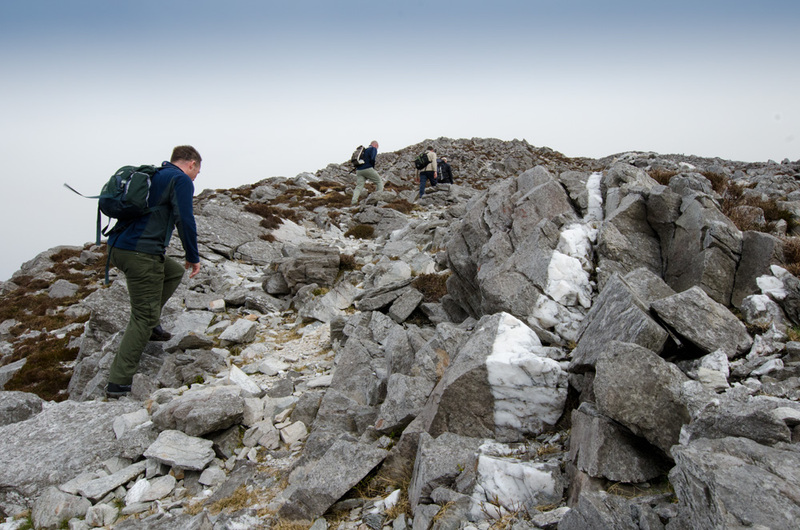 Two quite steep climbs then ensued, with a long, flat and quite narrow ridge in between, up onto the broad summit plateau. 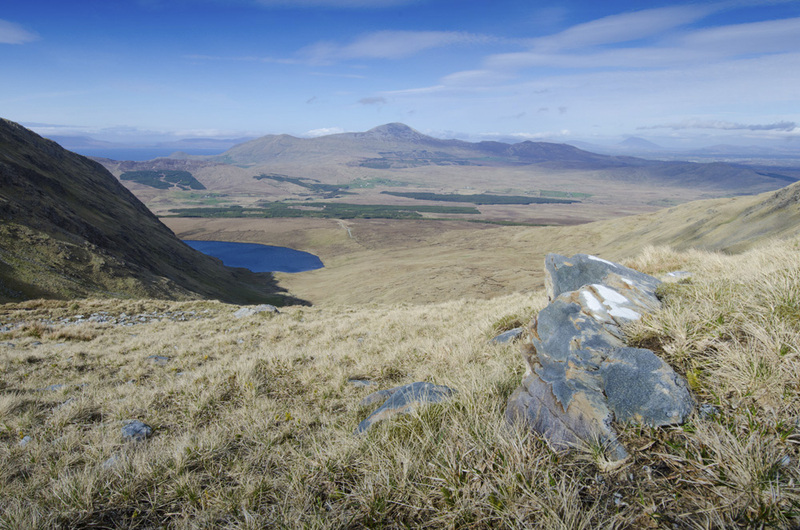 This plateau is dissected by small streams, ponds and peat hags that was reminiscent of Kinder Scout. 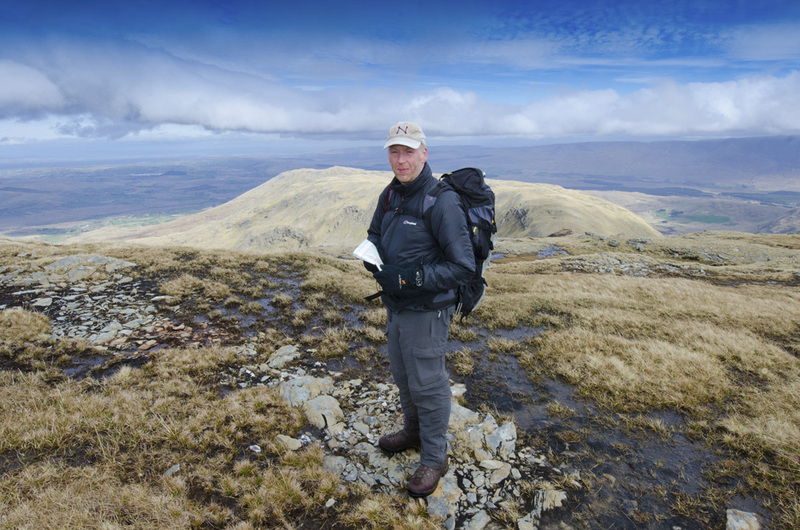 No paths whatsoever, so a compass bearing was essential to hit the small cairn that marks the 742m spot height. 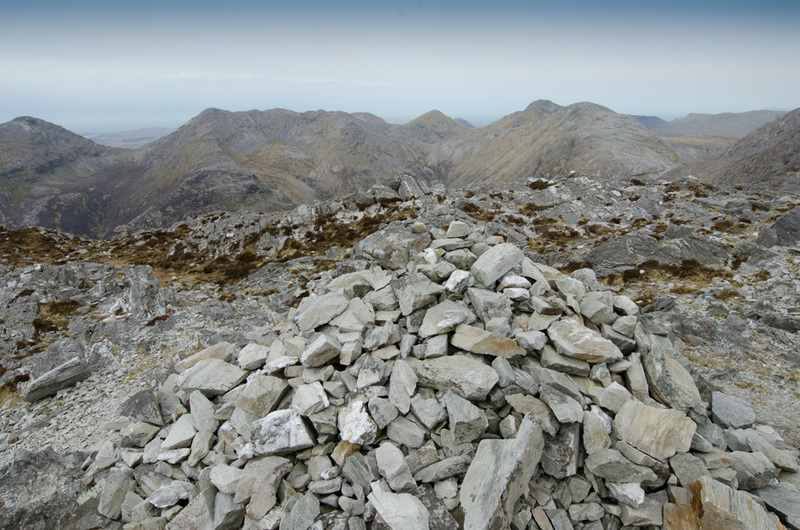 And what a view from this cairn, with Croagh Patrick and Clew Bay in the distance. 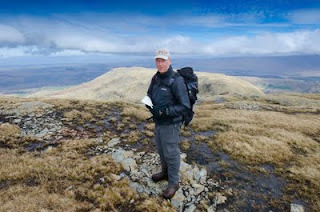 From the summit, headed east to reach the brow of the steep and fairly narrow ridge that leads down into a narrow col on its northern arm. 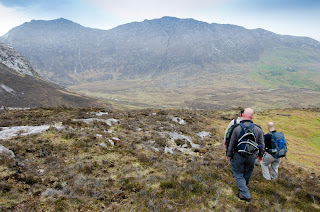 Then continued over a slight rise of land before a long and steep descent topick up a stream that took us back into Glenlaur. 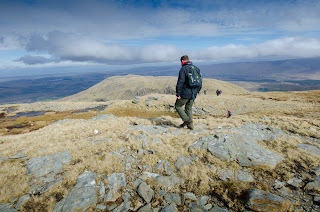 A total contrast from yesterday's walk - grassy/boggy underfoot, only one major climb and navigationally slightly more difficult because of the sprawling summit plateau.